Exploration, Excitement, Experiences. They are what the PADI Advanced Open Water Diver course is all about. And no, you don’t have to be “advanced” to take it – it’s designed so you can go straight into it after the PADI Open Water Diver course. The Advanced Open Water Diver course helps you increase your confidence and build your scuba skills so you can become more comfortable in the water. This is a great way to get more dives under your belt while continuing to learn under the supervision of your PADI Instructor. This course builds on what you’ve learned and develops new capabilities by introducing you to new activities and new ways to have fun scuba diving. The Advanced Open Water course can also be done in conjunction with weekend escapes or two day trips (as long as we can get depth). Diver with wobbegong shark, Fish Rock Cave, South West Rocks, NSW. 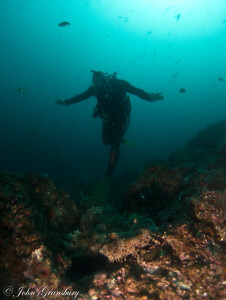 A sampler of three more Adventure Dives determined by the sites available and conditions. 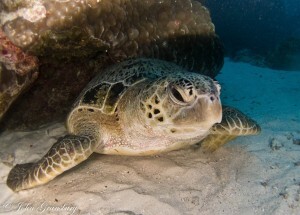 We will always endeavour to accommodate your want for a specific adventure dive and will do it if at all possible. Make sure you get what you pay for. The whole point of the course is to ensure you are comfortable with your new depth limit and teach you a variety of skills that will make you a better diver whilst giving you more confidence in new diving situations that are meant to challenge you but be fun at the same time. Be careful of offers of cheap courses that promise to get you to 30m but claim that if they can’t it is due to safety… It is hard to get you to 30m if the max depth at the site is only 20m to begin with… Yes by definition any dive over 18m is considered a “deep dive” but we will ensure you get you to 30m or within metres of it and do it safely as there are multiple sites where we can do it! One reason you’ll love the Advanced Open Water Diver course is that you and your instructor choose from 15 types of Adventure Dives to complete your course. You can try your hand at digital underwater photography, wreck diving, night diving, peak performance buoyancy and much more. We can assist you with any of your gear purchases to ensure you get the best gear at the best possible price. Though there are some items available for hire upon request. Whilst you will receive an online learning pass which will cover the main dives conducted as part of the Advanced Open Water course , you may also elect to purchase PADI’s Adventures in Diving Manual and DVD which provide information on more than 16 types of specialty diving.You’ll use them as a guidebook to improve your diving skills and prepare for new experiences and adventures. To purchase this product please contact Lisa on [email protected] or call 07 3204 5857. If anyone is interested in doing a specialty in conjunction with the live aboard I will be happy to facilitate it for you! There are over 12 specialties you could do over the weekend including Nitrox, Deep, Digital Underwater Photographer, Underwater Photographer, Underwater Videographer, Search and Recovery, Peak Performance Buoyancy, Underwater Navigation, Dry Suit Diver, Shark Awareness, Underwater Naturalist and more! This is the perfect way to specialty courses as you have already paid for the dives!! 🙂 For specialty course prices please email me with the course(s) that you are interested in [email protected] . In terms of gear aside from the usual you must ensure that you each provide a safety sausage (there is a great safety sausage and whistle pack at Adreno for $19.95, dive knife, whistle (of course! ), dive torch/light and a cylume/glowstick to mark your tank for the night dive (there are also great Pro Blue tank marker / LED lights in constant or flashing in green or orange at Adreno for $19.95 – Awesome if you think that night diving may become your thing!). If you are planning on doing the night dive you will also need a dive torch/light. There are a variety of models to suit every budget so please ensure that you have at least one light for the dive. I am sure most of you have these items already. Your PADI Advanced Open Water course can also be done in conjunction with a weekend trip for an additional minimal cost on top of the trip price. Contact John on 0457 007 040 or at [email protected] to discuss. After you’ve tried a specialty in the Advanced Open Water Diver course, you’ll probably want to take the whole course and learn more:altitude diving, AWARE-fish identification, boat diving, deep diving, diver propulsion vehicle use, drift diving, dry suit diving, multilevel and computer diving, night diving, peak performance buoyancy, search and recovery, underwater nature study, underwater navigation, underwater photography, underwater videography, wreck diving and many more! Talk to John anytime on 0457 007 040 or at [email protected] about the specialties you want to do and taking the PADI Master SCUBA Diver challenge!